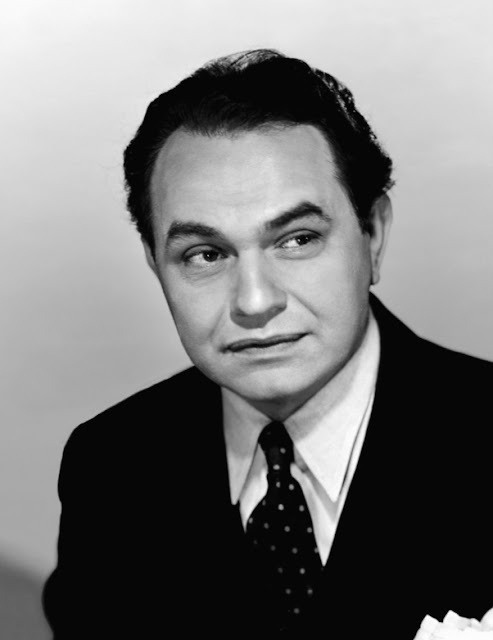 Edward G Robinson could attack a role and make it not only his, but perpetuate a level of expertise that would keep others from having the same effectiveness in the casting. Born in 1893, this Romanian-American cast a spell over Hollywood with his dynamic approach to serious acting that transcended the industry. Most people remember his as Ricco in Little Caesar and the too-ambitious dathan in The Ten Commandments. In his 50 years of acting, Robinson was cast in more than 100 motion pictures and a sampling of stage. His voice was used in a few on-air radio characterizations of hit dramas. Besides being an ardent actor, Edward G. participated in politics during the 30’s and 40’s as a die-hard opponent of buying German made goods. Robinson, however, became entangled in the 50’s congressional witch hunts of communist sympathizers, which Robinson was able to keep his name clean. However, like many an actor during that period of our country’s history, Mr Robinson saw less in the way of the big-name pictures being sent his way. He continued to participate in acting and entertaining as the proverbial tough-guy. He was married twice, and had one son who also became an actor. Edward G. Robinson made his character’s become as real or personable as how he felt they should be. He knew his craft, and played it well.